"After last year's matches Liandri saw that the first Biosource Arena on Na Pali received very good ratings by the audience so this time, instead of using an abandoned factory, the rulesboard decided to use a fully functioning facility. Welcome to the BioGes conversion plant on Espion, the only habitable moon of '08 Saiph bE', one of the largest gas giants ever found in the galaxy." 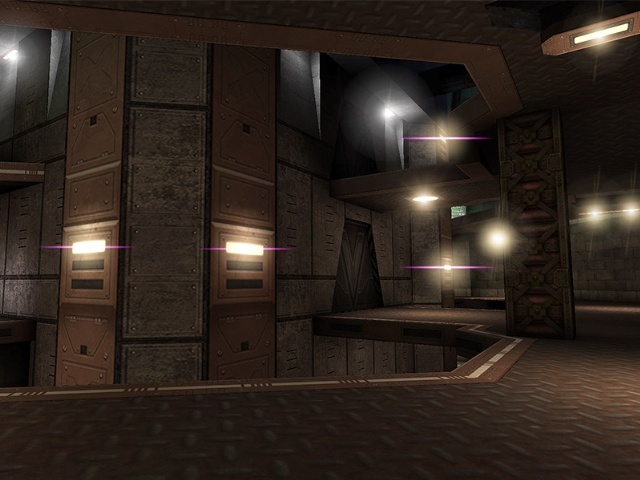 This map is a (tweaked) remake of my Unreal Tournament 3 level DM-Biosource. 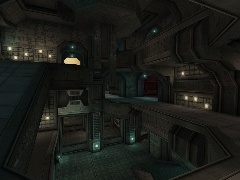 Layout is inspired by the Q3Tourney4 level from Quake 3 Arena, but you'll find that this is not a 1:1 copy of that map. Infact the layout has been jiggled around to be more suited to duel: it is not simmetrical, there is an additional room and pickup positioning is totally different. The purpose of all this is to make the map a bit harder to "lock" by skilled players. Belt and shock, for example, are on the opposite side of the map and shock ammo are very rare. Also health vials and medikits are all on the ground floor, forcing players to move from the safer spots. So 1on1 is obviously the recommended player load for this level. From my tests (and personal taste) you can go up to 6 players in FFA Deathmatch without too much suffering from weapon and ammo shortage, but if you're playing InstaGib or any other gametype that doesn't need weapon respawn you can even try with 8 players. 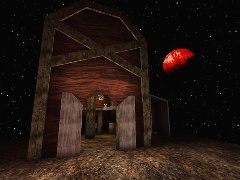 I decided to remake this level because I wasn't happy about how the UT3 version came out. I actually rushed that release because I wanted to submit it to the Make Something Unreal contest, so I didn't had time to create custom contents, test it properly and, most of all, tweak that ugly oversaturated lighting. (Doors are perfect tho :D) Epic then decided to leave UT3 to a (not so) slow death and that's the main reason I choosed UT to remake it properly, with custom textures and all the care needed.